Just because Beer Can Chicken is traditionally made with a beer can, doesn’t mean it has to be that way. In fact, it doesn’t even require a can at all. Using the Beer Can Chicken Kit one can add whatever liquid they feel like into the roaster. Set it on the grill and moist–truly original–chicken will soon be yours. 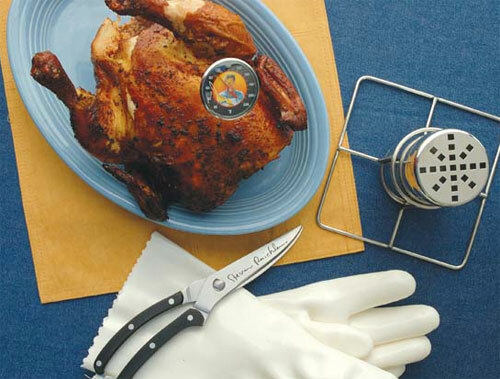 The Best of Barbecue Beer Can Chicken Set includes: One stainless steel Beer Can Chicken Roaster, one Instant Read Thermometer, one pair of Signature Meat Shears, one pair of Insulated Food Gloves and six recipe cards.